Next Sunday, May 11, is Mother’s Day. It isn’t lost on me that I am incredibly blessed to have been raised by a gentle, brave and compassionate mother. Her love for her children was fierce and her faith was deep. We shared a vanity area of the house in my early adult years. To get there, I went through the master bedroom. Depending on the timing, I would find her kneeling at the end of her bed, praying with Dad as they started their day. They did this every morning for most of my life. Our house was the gathering place for lively parties over the years. When we all grew up, Mom and Dad moved north from Southern California to Redding, where they bought a blueberry farm. Their grandchildren nicknamed them Grandma and Grandpa Farm. A trip to the farm meant well-thought-out breakfasts, light lunch and hearty dinners. Depending on who was there, we’d try something new or a requested favorite. No matter what, it was a group effort. All hands were on deck to create a meal to laugh over. It was always good, fresh and a labor of love. Mom’s table welcomed anyone and everyone, anytime. Homemade granola is now called “Gorilla,” renamed by my niece, Hannah. The fragrance of oats and vanilla hang in the air as it cooled on a cookie sheet. My brother, Steve, still requests her Enchiladas for his birthday dinners. The recipe, more like wet burritos, was one she created to stretch a meal for seven people. For Mom, growing up during the Great Depression had sealed a frugality that lasted throughout her life. This will be my sixth Mother’s Day since Mom passed from Earth to eternity, holding Dad’s hand. She left a legacy of love and family. With that we still make some favorite dishes that always remind us of her gentle smile, uncontrollable laugh and compassionate spirit. We also remember to pass the Gorilla! Mom took several classes on microwave cooking one year. This was one of her most used recipes from that class. Don’t let the idea trip you up. You can adjust it to an oven, but why would you? 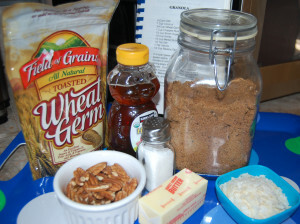 In 3-quart glass bowl, blend dry ingredients (except raisins). Mix butter honey and vanilla. Pour over dry ingredients and mix. Microwave on high for 8-10 minutes or until ingredients are toasted, stirring every 3 minutes. Add raisins last 3 minutes. Cool in a single layer on a cookie sheet. Store in a covered container. I serve it with milk or yogurt. Some folks like it sprinkled on ice cream. I swap dried cranberries for the raisins and use slivered almonds. I swap maple flavoring for the vanilla and use walnuts. These are not technically enchiladas, but growing up, it’s what we called them. Mom added the refried beans and used flour tortillas to feed a larger family. When these were developed there were only two types of tortillas in the store. Not an abundance of sizes. Brown ground beef and onion in large skillet. Add Mexican seasoning and refried beans. Heat through. Add black olives and remove from heat. Heat sauce in skillet. Dip tortilla in warm sauce, place in large baking dish (9-inch-by-13-inch or larger). Add meat filling, sprinkle cheese and fold. Repeat process, pouring remaining sauce over top of mixture, and sprinkle with remaining cheese (be generous!). Bake in 350-degree oven until cheese bubbles.